This page created 27th March 2012. 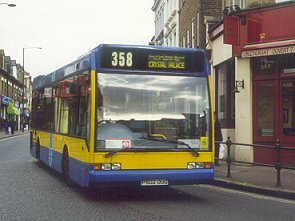 Metrobus' meandering route 358 (Orpington - Bromley Common - Bromley - Shortlands - Eden Park - Beckenham - Penge - Crystal Palace) had been a considerable success, and patronage persistently outgrew the buses used on it. In August 1996 Metrobus bought ten 10.7m Optare Excels for the route, painting them in house colours of blue and yellow. They had low-floor and route branding in pale blue. Operation was from the Green Street Green depot (MB). 502 passes through Bromley on its habitual 358 to Crystal Palace, March 2000. The goldfish bowls - as they were colloquially known - stayed at Orpington until March 2001, when the upheaval at Crawley, when Arriva took its ball away, gave Metrobus the opportunity to move them out. They went to Crawley, ostensibly for routes 4/5. But it was quickly found that loadings on route 1 had perked up significantly after the takeover, requiring bigger buses than the allocated Darts. So the Excels were switched to the 1. Loadings continued to increase, and in June 2001 the Excels were replaced by Olympian double-deckers. The Excels were sold as a batch to The Birmingham Coach Co, Tividale, becoming 101-110 there. They came back into the Go-Ahead Group when that company was taken over, and then became part of the Rotala Group in 2008 by sale of the company. Perhaps it was that change which signalled a new move for the Excels, which now dispersed. Four of them came back south, to Trustline at Hunsdon, near Hertford, in April 2008. 501, 504, 506 and 508 were acquired, 504 for spares only. The other three were operated during 2008, mainly on routes 22, 33 in Harlow. All four were sold on to Coachlease in January 2009. 511 was an Excel2, loaned by Optare in December 1999, as part of an evaluation trial, for use on route 353. It did not stay very long, being returned to Optare in October 2000. It was bought by the Port of Dover, who used it as a courtesy bus. Bus Stop XL Index. Metrobus XLs. histories. photo refs. Capital/TGM XLs.